There’s a new generation at the table, and it presents a huge opportunity for the financial services world, if the industry plays its cards right. Recent U.S. Census Bureau data indicates that there are currently 74 million members of Generation Z, forming about a quarter of the total U.S. population. Although they are probably years away from being clients (LIMRA defines Gen Z as those born in 2000 or later), there is evidence that their financial personalities are formed early in life. It may be in the industry’s best interest to help influence Gen Z’s financial decision-making and financial behaviors now rather than wait until later. This implies that with a basic financial education today, and with a little help from millennial experiences, Gen Z will be better prepared for their financial futures. In 2017, LIMRA surveyed those members of Gen Z who are high school students ages 16 or 17 in order to better understand what financial advice and tools would help them prepare for their futures. Not surprisingly, the most important topic they want to learn about is financing options for their postsecondary education (see chart). 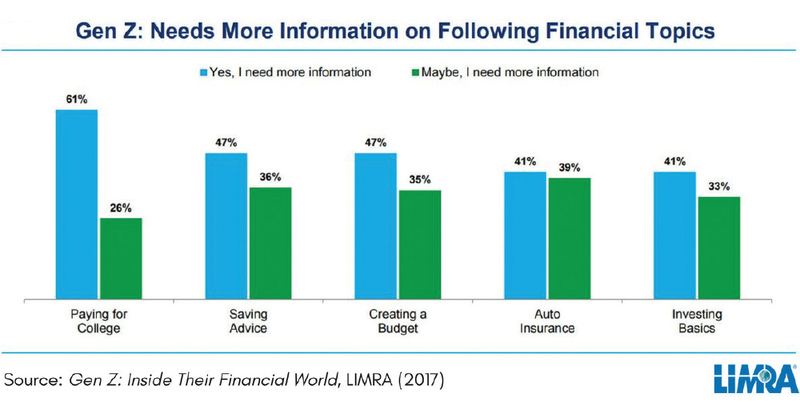 Gen Z is also aware (but to a lesser extent) that they need information on money management, including budget creation and saving strategies. Considering this hindsight from millennials, we can determine what topics should be included in a financial education course for Gen Z. These topics may result in less financial stress for Gen Z and can provide the foundation for more stable financial futures. So how can financial professionals help those in Gen Z about to enter the real world of financial management? Here are a few suggestions. » Start all your finance conversations with Gen Z by discussing financing options for college. This topic is highly relevant to Gen Z now, and they will find that money management skills (including budget creation) and saving are all interlinked. » Proactively reach out to those clients who have children in high school. Provide parents with financial information (through a link to online material, for example) they can give to their children. » Develop a short discussion guide about student loans. This is critical, as many (if not most) students will end up with some student loans. A 2015 survey of young consumers who have student loans found that many were confused about their repayment options and by the paperwork needed to repay loans. » Start a local program to educate high school students. Besides providing information to Gen Z, the program can prove to be an effective way of increasing your client base should these students’ parents contact you. Nilufer Ahmed, senior research director of LIMRA’s Market Research, is responsible for conducting research related to unique markets (e.g., women, Hispanics, African-Americans and Asian-Americans). Nilufer can be reached at [email protected].